through after co-directing the 1999 phenom The Blair Witch Project. Now credited as a director in his seventh feature film, Sánchez uses the style of storytelling “Blair Witch” championed – found footage – in his latest work: a short film segment in the horror anthology sequel V/H/S/2. He originally connected with the writer of that segment, Jamie Nash, after finding him on InkTip in 2004. Since then, they have collaborated on six feature films together, including V/H/S/2. Though found footage had been popularized in documentaries such as the films of Ken Burns, and in mockumentaries, such as Orson Welles’ F for Fake, the public experienced it at a wide level in groundbreaking fashion with Blair Witch, which cemented Sánchez’s handprints onto not only horror’s sidewalks, but onto those of a future generation of filmmakers making all types of movies. To understand its context, we must first go back to 1999, a year so seminal for Hollywood – and not only because it brought in big dollars – that it shifted the culture of moviemaking from lessons the landmark films taught us. The Matrix taught us to experience bullet time and that some DVDs, due to not only the movie's rewatchability, but the special features, were must-buys. The world awaited Star Wars Episode 1 and though that may have disappointed generations of fans, many then decided that the real "cool" film, anyways, was the one you’re not allowed to talk about: Fight Club. American Pie served heaping slices of gross-out comedy to teen/college audiences, while American Beauty taught us that being normal is overrated, especially when the abnormal win Oscars. The Boondock Saints taught us that cult hits (and directors) can rise quickly and fall just as fast, and Magnolia reminded us that big action stars like Tom Cruise can return to their dramatic roots and (almost) win an Oscar. The Sixth Sense taught us to see dead people everywhere we go and twist endings in every movie we watch, while Being John Malkovich taught us that originality in Hollywood is not dead. Quite an impressive list. Yet one film had an influence that permeated the filmmaking experience from conception through marketing like none other from that year: The Blair Witch Project. or not, cleaner)—became the most profitable film of all time, Sánchez and company stood atop the proverbial mountaintop of underdog box office success stories, reportedly making “Blair Witch” with $60,000 and hauling in $248 million globally. It wasn’t so much that it was shot in found footage. That helped. But everything about the film made perfect sense in perfect timing, especially compared to those other higher-budget movies that year. For Sánchez and his Haxan Films banner, he kept working, making more and more horror movies, such as Altered (2006) and Lovely Molly (2011) through his long working relationship with Nash. As a veteran of the horror movie universe, Sánchez was chosen to direct a spot in the found footage-filmed V/H/S/2, which is akin to asking the Wachowskis to direct a sci-fi movie with plenty of bullet time sequences. Yet if it sounds like Sánchez’s career has been unceremoniously rewound, it hasn’t. Fans in horror often have a way of showing appreciation by acknowledging influential filmmakers and stars perhaps more than in any other genre, and demanding that they appear in or direct more movies. And though Sánchez avoided filming in found footage style until he shot 2014’s Exists, that influence carried on in recent years in other genres of movies such as sci-fi (Cloverfield), action (Chronicle) and comedy (Project X). Some are hits, some not so much. A lesson the years that have passed since“Blair Witch” premiered taught us is that even if we’d like to repeat history’s surprise victories, they seldom happen when we try to manufacture them. If an alternative civilization watched a found footage movie of Hollywood’s activities, they may see more swing-and-misses than hits, but they’d at least see plenty of hopefuls at bat, swinging away. Much of that confidence is due to a $60,000 film from '99. 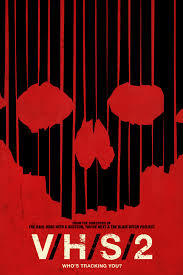 V/H/S/2 (2013), the anthology sequel directed by a stable of horror and midnight movie filmmakers such as Eduardo Sánchez, and written by Jamie Nash, amongst seven others, is available for rental and purchase.